Torture is defined as: The action or practice of inflicting severe pain on someone as a punishment or in order to force them to do or say something. Weigh in: Does forcing voters to stand in line for nine hours in the blazing heat in order to vote equal torture? Is it a form of both physical and mental abuse? Florida Gov. Rick Scott (R) is standing by his decision not to extend early voting hours, despite the fact that some voters said they waited as long as nine hours to cast a ballot. The WXMG reporter tried to follow up again and ask whether hours should have been extended, but a member of Scott’s staff appeared to end the press conference. When Scott was asked again while walking with reporters, he repeated his answer. I live in the small Midwestern town of Fairfield, Iowa, where the ride to my voting location takes five minutes and I waited 10 minutes to vote. So, I consider the people who waited 9 hours or more to exercise their voting rights in the recent Presidential election, American heroes. And, when I learned Florida Gov. Rick Scott (R) still stands by his decision not to extend early voting hours in the recent election, like he did in 2008 when he was governor, I conclude this is a clear example of voter suppression. I am of the opinion, he was hoping the long lines and miserable conditions would deter voters. Do ya think!? Imagine this – you work all day at one, two, or three job – you really cannot afford the time off to wait in line for nine hours to vote. You stand in long lines hour after hour in the heat as you become increasingly dehydrated, your legs and feet start killing you, your arthritis or other pain parts begin screaming, you are freaking out because your kids are home alone, or your dog hasn’t been let out for hours, you have an appointment you had to cancel that costs you dearly, you becoming increasingly pissed because you know you are being screwed by a group of power players who don’t want you to vote. You know this is a calculated strategy to disempower you. You know that they know who you are and predict you will vote for the opposition. They know all about you because of where you vote – your precinct identifies you as unlikely to be one of them – they figure you are not a rich white guy, they have you profiled as Black or Hispanic because you live in Miami-Dade, or they recognize that your precinct usually goes Democratic. 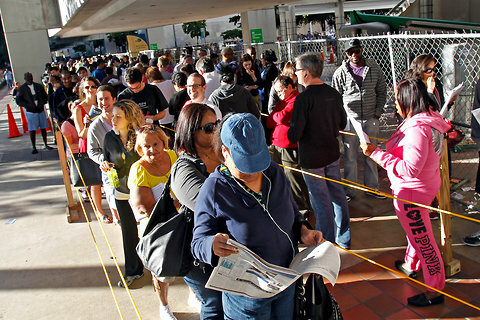 Come Election Day, it’s no better – it’s likely you will be required to wait in line for up to six hours. They see you as the part of the problem – you are going to vote Democrat. I’m a white woman, mailed on my vote and thank God Obama won! HAHAHA! Yes, I can’t explain the relief – the alternative was just too frightening!